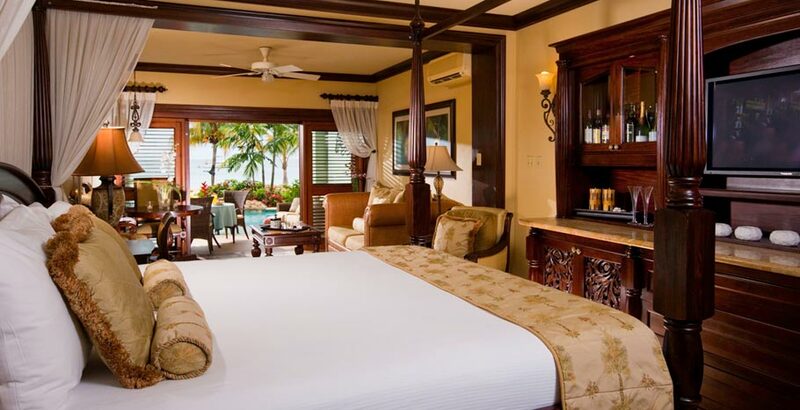 Whether you are celebrating your Caribbean honeymoon, destination wedding, 25th wedding anniversary trip, or just a much needed Caribbean getaway with the one you love, a Sandals Love Nest Suite is the perfect location for reconnecting. 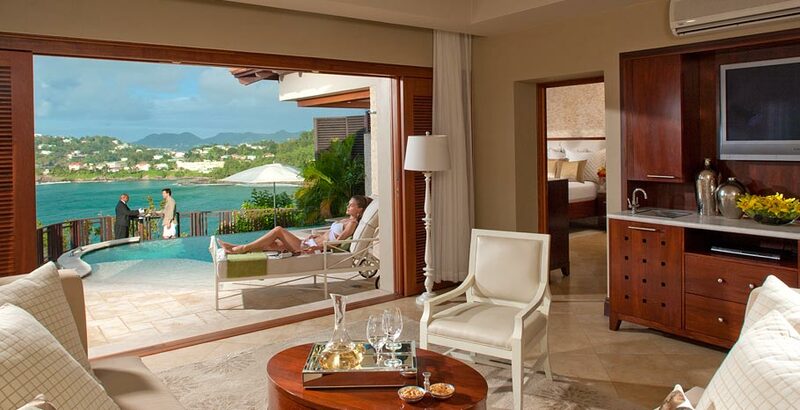 Created in the true spirit of romance, Sandals Resorts Love Nest Suites are among some of the most lavish collection of suites in the world. The most innovative designs, exotic and private settings, luxurious bathrooms, and amenities like plush terry robes, hand-embroidered Egyptian cotton duvets, plasma TVs, and the service of a personal butler are just some of the details that make the Love Nest Suites so desirable. 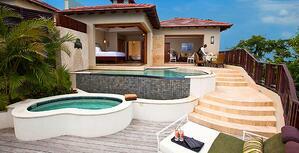 10 of the 13 Sandals Resorts boast these exclusive villas and suites. 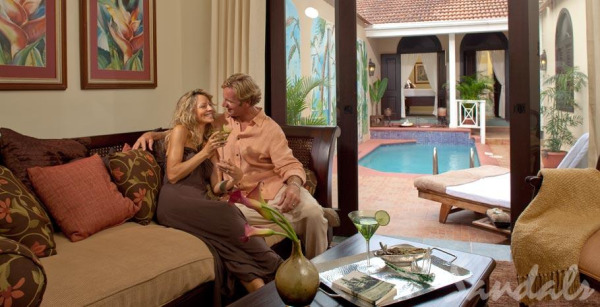 Each of these resorts has a least three different signature Love Nest Suites to choose from. Here are a few of The Sand Lady's favorites. 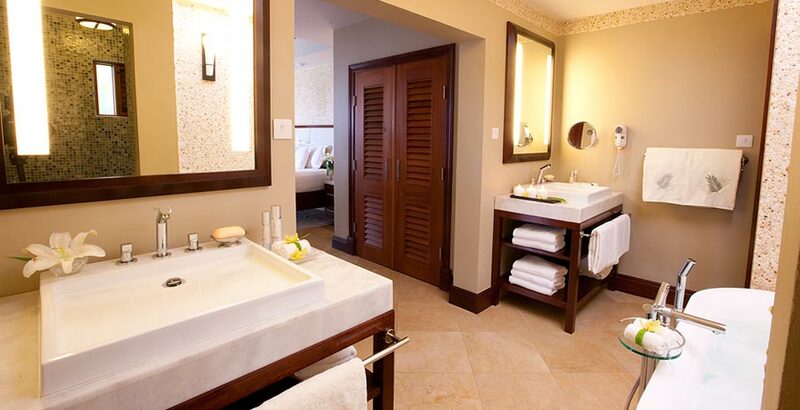 Set in beachfront cottages, these Love Nest Suites of the Bay Roc Villas feature gorgeous hand-carved mahogany furniture, French double doors, hand-painted frescos, marble walk-in showers and deliciously soft Egyptian cotton linens. 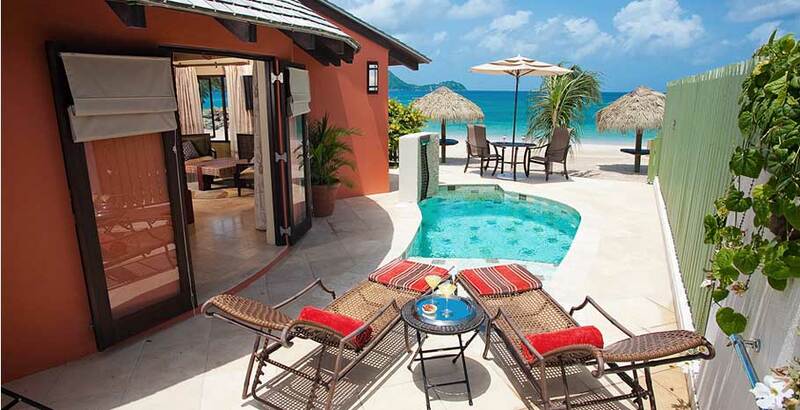 The Prime Minister's Beachfront Suite is located on the second floor of the beach cottages at Bay Roc Estates. 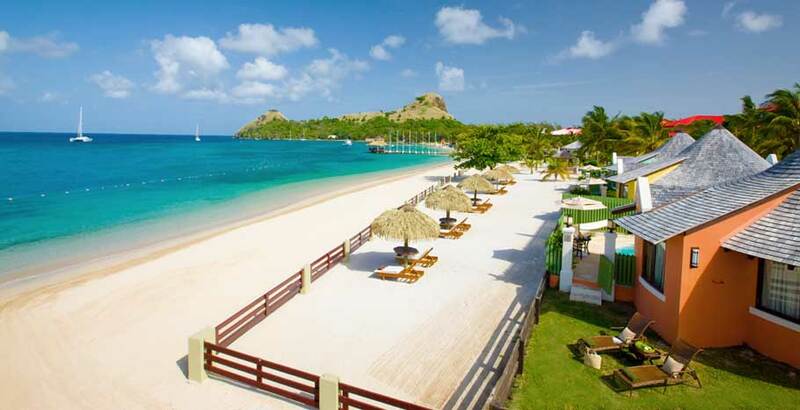 Set directly on the beach, these expansive suites feature a spacious living area and dining area. These suites offer a luxurious, separate grand bedroom with mahogany furniture and king-size four-poster bed, a marble bathroom and an oversized private sundeck. You'll enjoy the services of a personal butler and VIP airport transfers in addition to two large screen plasma TVs, a stocked wet bar, and an iPod docking station. 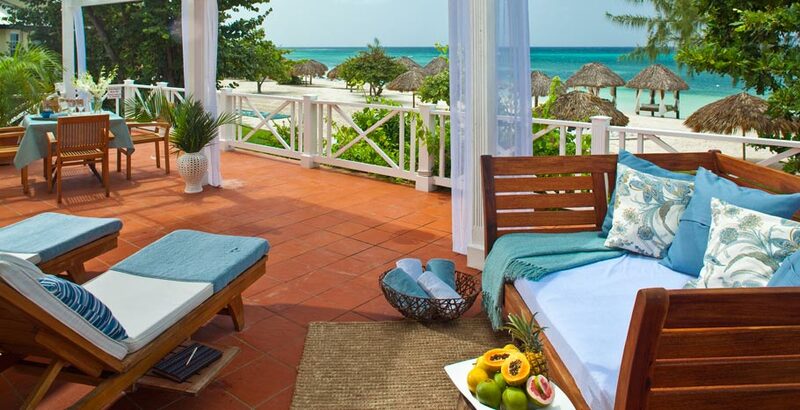 From your beachfront suite, you'll have access to some of the most beautiful and secluded stretches of the Montego Bay coastline. The Crystal Lagoon, set beautifully amongst the lush landscape and tropical vegetation of the resort, is the perfect retreat for guests who choose to let their worries melt away in the calming waters. These magnificent one-bedroom suites with personal butler service are located on the first floor and offer zero-entry access to a sparkling pool. 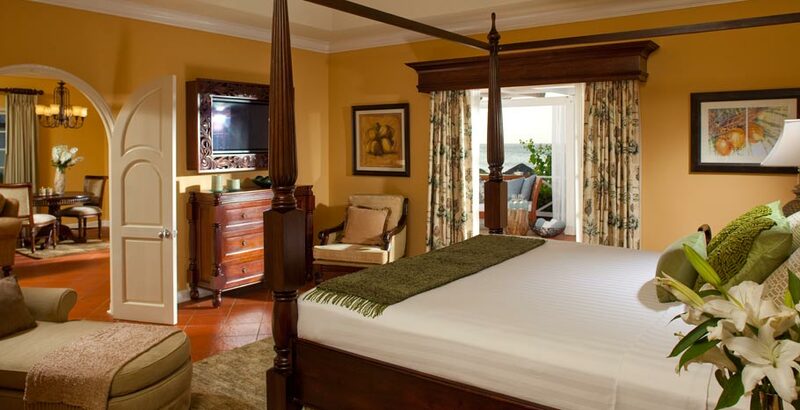 Suites include an expansive living room complete with 42" plasma TV, separate bedroom with 37" plasma TV, fine mahogany furnishings, tiled floors, whirlpool bath and walk-in shower. Large patios overlooking the sparkling pool and the ocean feature an outdoor dining area, as well as a love seat for the ultimate in relaxation under the warm Caribbean sun. The sunset view from your private patio is NOT to be missed! 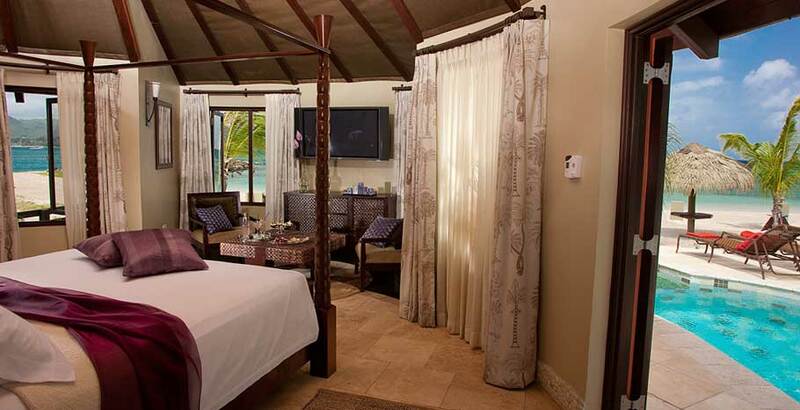 This suite is a uniquely intimate retreat offering the ultimate in privacy. With entrance via its own walled courtyard, this exclusive 1200 sq. 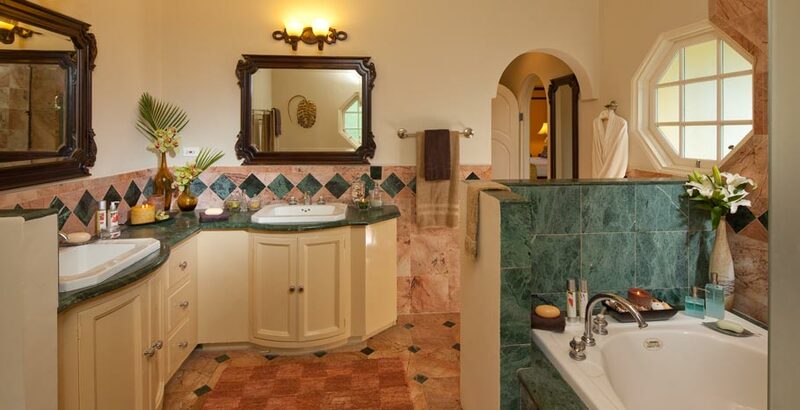 ft. suite comprises a luxurious bedroom at one end boasting a king-size four-poster bed, exquisite mahogany furniture and substantial en-suite bathroom with double vanity and sunken bath while at the other a stylish lounge with fully-equipped kitchenette. The vast courtyard itself provides the ultimate focal point with its very own Roman pool and hot tub overlooking stunning hand-drawn murals. 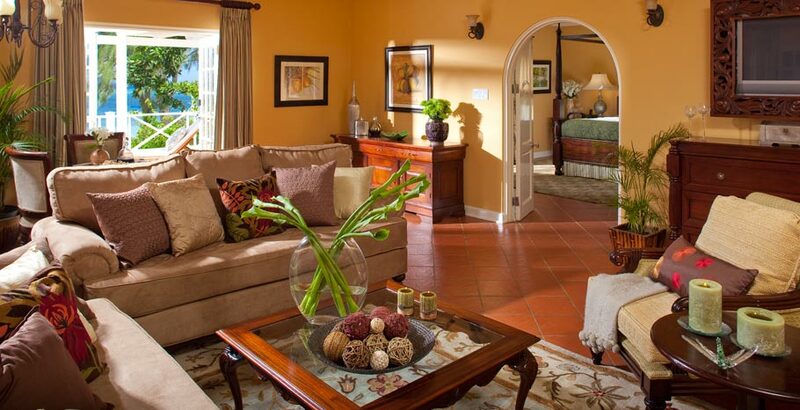 Set on the highest peak of the resort, this Mediterranean-style suite offers a luxurious bedroom with mahogany furnishings, and a spacious living room with plush sofas, a 42" plasma television and a stocked bar. Opening the living room's plantation-style pocket doors reveals a private three-story sundeck with a private infinity pool and whirlpool, and grants unobstructed 180-degree view of the Caribbean Sea. 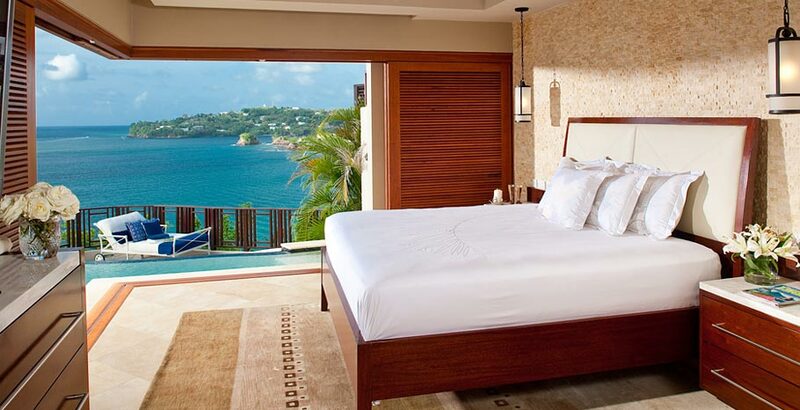 The bedroom features unique sliding glass walls that allow you incredible views and direct access to the pool and sundeck, plus a mahogany, king-size bed and a second 46" plasma TV. 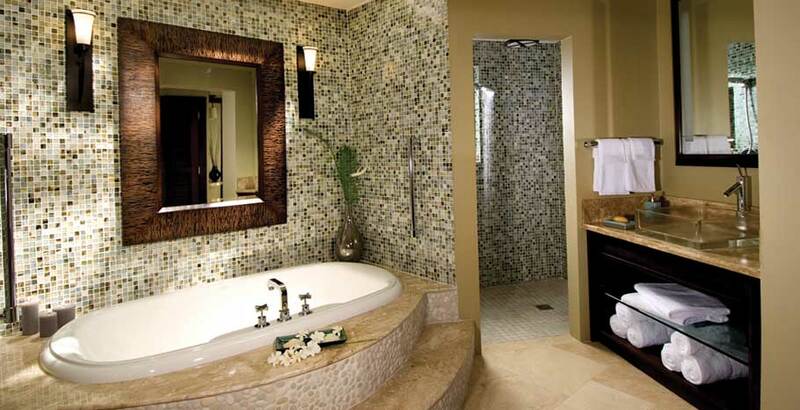 The marble bath features double vanities, a tub and a separate walk-in shower. This private escape comes complete with exclusive butler service, 24-hour room service and private car transfers to and from both airports. Each Rondoval Suite features a large interior living area with a sofa, occasional chair, desk, and a 50" flat screen television. 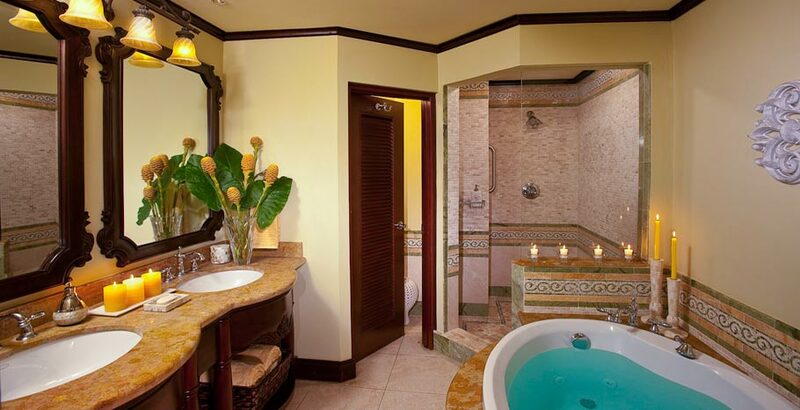 The king bed sits at the center of the suite, and at the back of the suite lies an enormous bathroom with Roman tub, separate showers and two vanities. 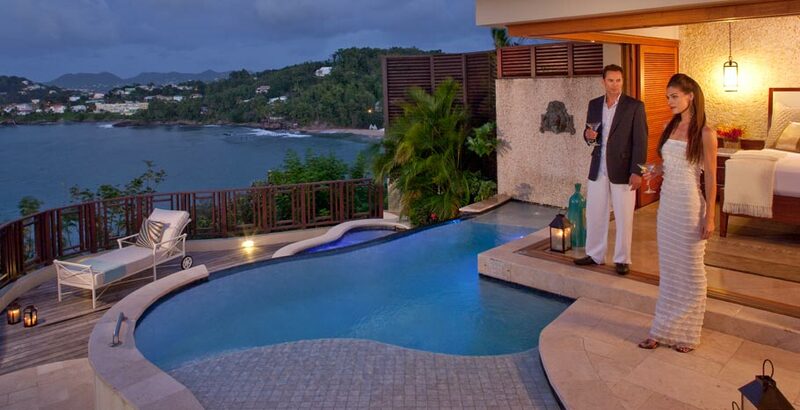 Step outside from the shower onto your private pool deck and enjoy an outdoor shower, or slide into your private whirlpool or into your private plunge pool. In fact, you even have your own private hammock. For those discerning guests who are looking for a new and elegant experience... here it is! 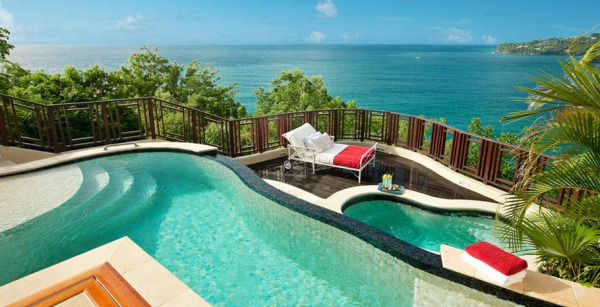 These are just a few of the Love Nest Suites - the Caribbean's most magnificently romantic collection of villas and suites for two people in love. 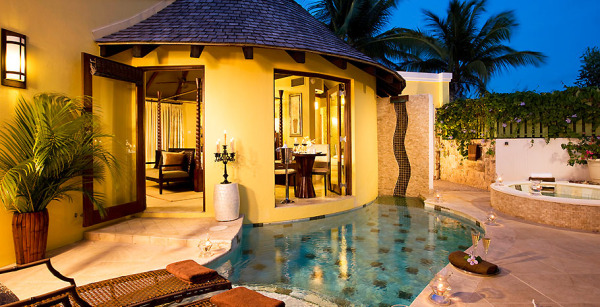 I can't wait to help you plan the most exotically romantic getaway you've always dreamed of. Contact Us today and we'll get started!